Was anyone up at the witching hour to see the first midnight showing of the final Harry Potter movie? I was awake, but I was captivated by the third season of TrueBlood, another series that materialized from the pages of a fantasy book. I am conspiring to see Deathly Hallows, Part 2, but am trying to be patient until the hysteria dissipates before apparating over to the theater. Instead I rode my broomstick over to Etsy, where there is never a waiting line or screeching child. I cast a summoning spell and these magical lockets appeared to quell my Harry Potter fix. Great, I love the letter especially. I agree--I want to see the movie, but not crazy crowded. I can wait a few weeks. Me thinks you had me in mind...heehee, I'm loving this. Oh....how about Sunday or Monday evening........? Those are all amazing. Etsy is full of talented people! :D I love the owl and the letter. Hi, Sweetie! Lovin the Pottermania! These are great items! Harry Potter fans all over should love them. The brass owl! How stinking neat! 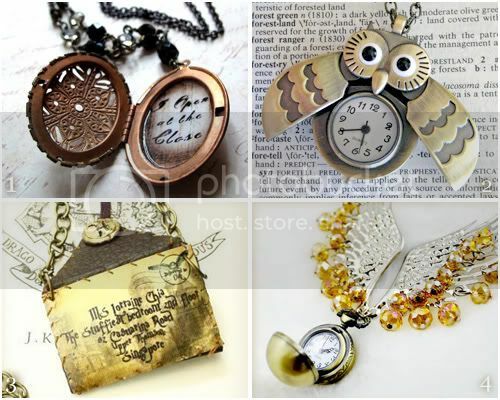 Thanks so much for featuring my locket. I think that personalized letter is brilliant! Hope you get to see the film very soon - I saw it the day it opened in 3D and my theater was not that full - everyone opted for 2D, so it might be easier to see it that way, sooner. those are fab! I'm a huge Harry Potter fan..
Hi, I enjoyed your article have a nice day.